Asters – Dig Delve – An online magazine about gardens, landscape, growing & making. 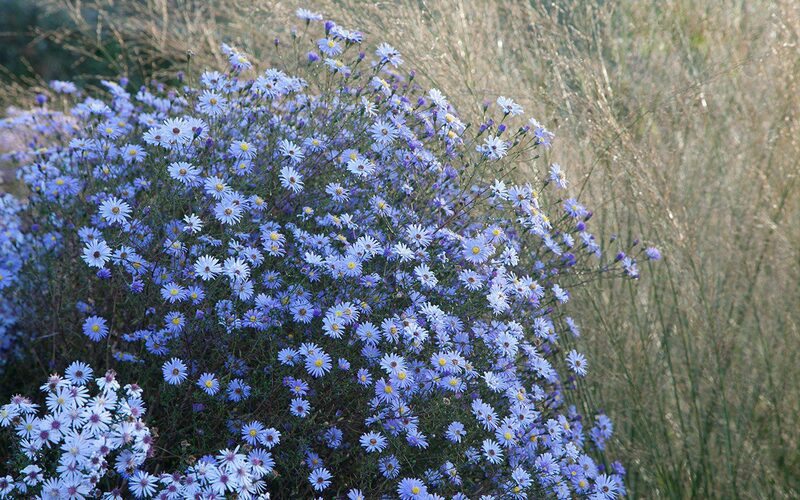 This is the third year of my aster trial and a good point to judge how they have performed. The collection, which I set up to broaden my palette, has scratched the very tip of an iceberg, which must run to hundreds of varieties. I currently have just twenty-six and I am at the point now of wanting to reduce them to a dozen or so. Some I have grown before, but the greater number have been selected from plant fairs and on trips to see the well-known collections at Waterperry Gardens and the Picton Garden. 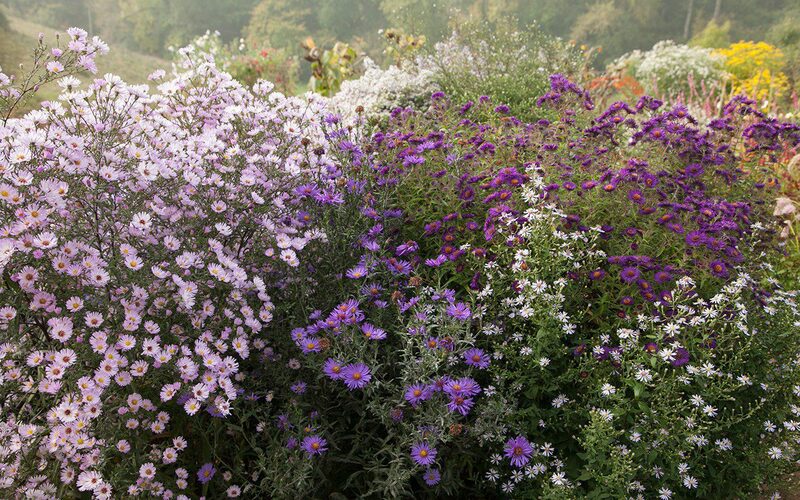 Asters are some of the best late-flowering perennials, the first flowers to hint at the next season in late August, and some of the very last to see the autumn out, their flowers hanging in suspension as the colour drains from everything around them. 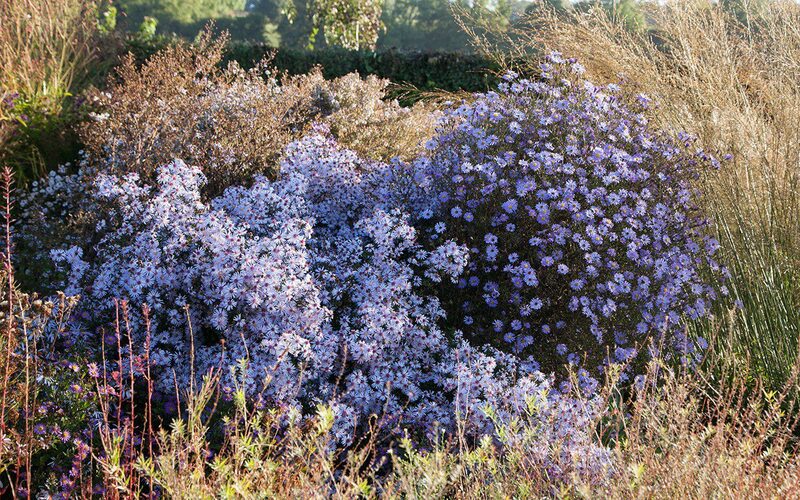 Aster borders were once celebrated in Victorian and Edwardian gardens, but they became unpopular for a period and with good reason. Many of the older varieties were prone to mildew and those that run could take a border over in the same time that I have been running my trial. I suspect this is one of the reasons that you see them naturalised along railway embankments, where they were thrown over garden fences in frustration, and where the strongest can compete with the buddleia and brambles. As I write, the sun is streaming down the valley at an ever-decreasing angle, having burned its way through a morning mist. We had the first frost in the hollows today, so I would say this was perfect weather for looking at my collection. In the penultimate week of October they are in their prime and they look their best in the softened light with the garden waning around them. I have spent the morning amongst them, taking notes and pushing my way through the shoulder high flower to trace them from top to bottom. I want to see if they have stayed put in a clump, and which ones can do without staking, as I’m aiming for there to be as little of that here as possible. I am smarting, however, as I have committed the ultimate sin when running a trial, for six of the labels are missing, buried within the basal foliage (I’m hoping) or – less helpfully – snapped off when weeding. Of these six I am going to keep two that have shown themselves to be special and, through a process of elimination from studying photographs and my garden diary, I will find out what they are. The others will be found a metaphorical railway embankment. In this case a rough patch of ground where the sheep won’t get them, but where they can provide some late nectar for the bees. I have just a small number of creeping varieties which I tolerate for their informality. 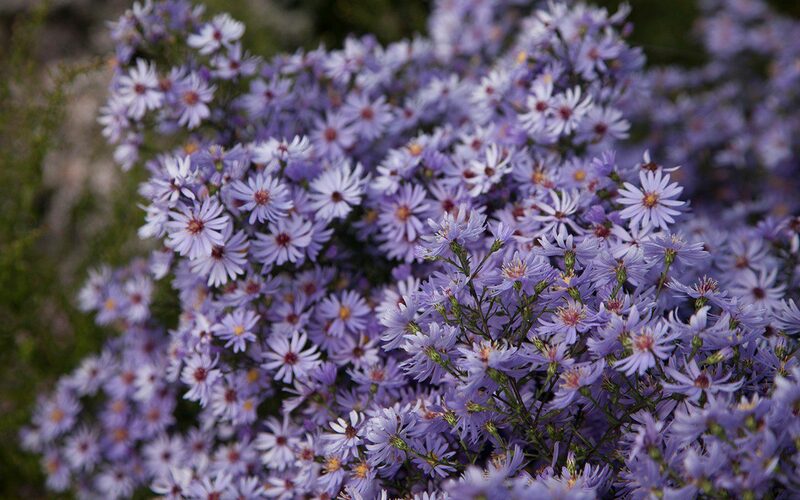 Although most asters prefer to be out in the open with plenty of light, the first three here are happy to live under the skirts of shrubs or in dappled shade. Aster divaricatus, a plant that Gertrude Jekyll famously used to cover for the naked patch the colchicum foliage leaves behind in summer, is one of my favourites. I have seen it in North American woodland where it lives happily amongst tree roots and spangles the dappled forest floor in autumn. Although it will not dominate here, as it does in the States, and runs slowly, it does move about, the dark, wiry stems leaning and sprawling and pushing pale, widely-spaced flowers to a foot or so from the crown. 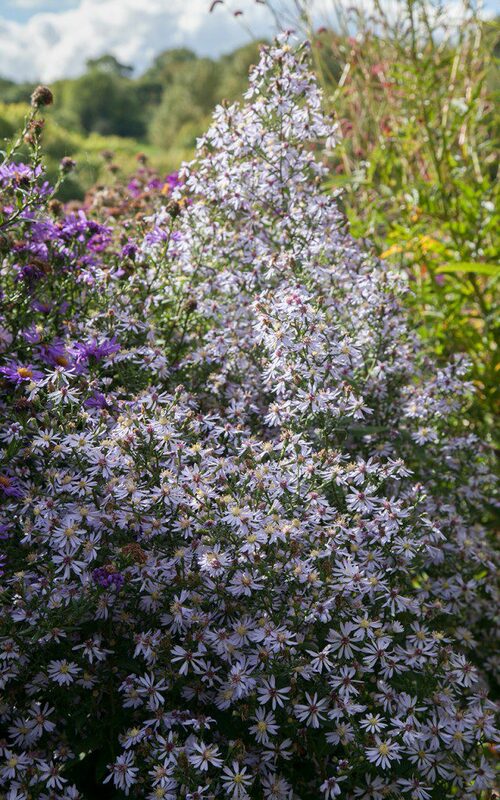 Aster schreberi is similar to look at, with single starry flowers, though it is stronger and has taken off in my hearty soil. I will put it amongst hellebores, which should be man enough to fight it out in the shade under the hamamelis. I will let you know who wins in a couple of years. Strictly speaking, I should be wary of Aster ‘Primrose Path’ for not only does it double itself in size every year, it also seeds. However, it is not a hefty plant, growing to just 75cm and, as it is also happy in a little shade, I am keen to keep it and use its ability to move around in the shadier parts of my gravel plantings around the barns. The flowers, which are small, but not the smallest, are a delicate lilac, each with a lemon-yellow centre. Most of the asters for the new garden have been selected for lightness of growth and flower, as I want the plantings to be transparent, allowing views of the far landscape into the garden. All, with the exception of the semi-double ‘Violetta’, are single. I like to see the centre of the flowers and I want them to to dance or to sit like a constellation in space rather than blaze in a solid mass like ‘Little Carlow’. Growing to well over a metre for me here, this is a really good plant, needing little staking and being thoroughly reliable, but it is too floriferous for me, the flowers bunched tight with little space between them so that the weight of flower seems impenetrable. ‘Coombe Fishacre’, though also densely flowered, is certainly a keeper, the centres of the soft pink flowers age to a darker grey-pink to throw a dusky cast over the whole plant. It is good for being shrubby in appearance and self-supporting. 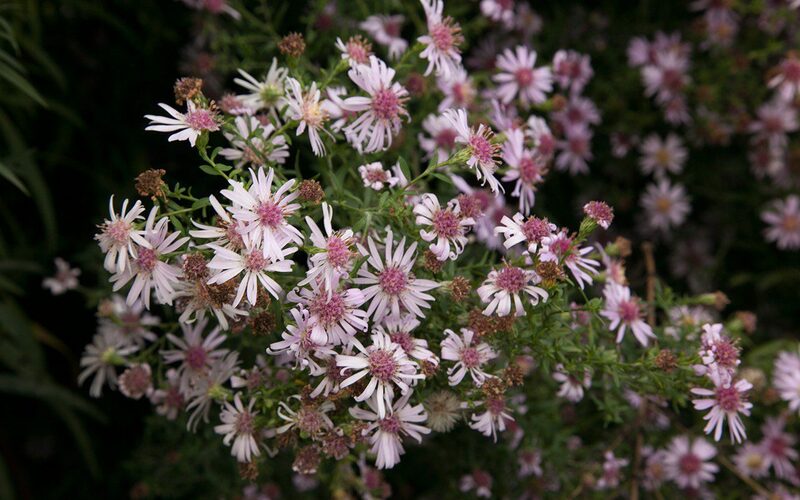 My absolute favourite Aster turbinellus (the Prairie Aster), is one of the latest to flower, its season running from October into November if the weather holds out. It is exquisite for the air in the plant, the foliage being reduced to narrow blades and the stems wiry and widely-spaced so that it captures the wind and moves well. I’ve used it in great open sweeps in the Millennium Forest planting as the finale to the season there. The flowers, which are a bright lilac and finely rayed, have a gold button eye. 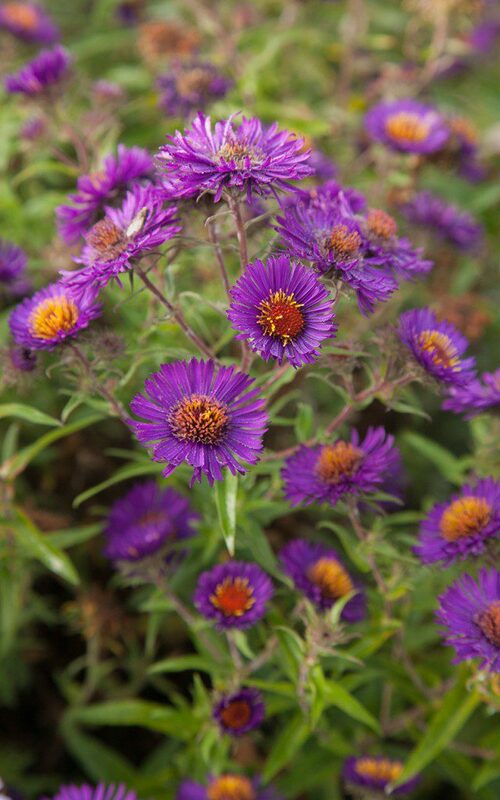 I have a form simply named Aster turbinellus hybrid that has darker stems and dark buds that may be proving to be almost better than the straight species. I will keep them both for now and they may well be lovely planted together for the feeling that they are related yet different. 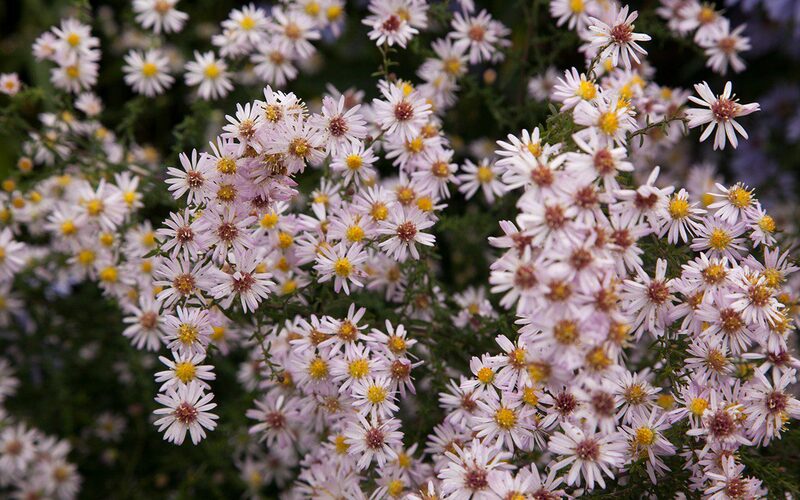 Aster ericoides ‘Pink Cloud’ also has a reduced leaf, although it is altogether more dense and arching in growth. It is proving a valuable contrast for the size of the flowers, which are tiny and held thousand upon thousand in arching sprays. Palest pink, this should almost be too pretty, but I have enjoyed the scale shift when it appears with the larger-flowered forms. Together they layer and billow like clouds and I’d like to see them take the garden in a storm of their own making. Come the spring, it is all too easy to forget about including these late season performers in a planting. The notes I am taking now will remind me of their importance at this time of year and will be a useful reminder when I make the divisions for inclusion in the new plantings.